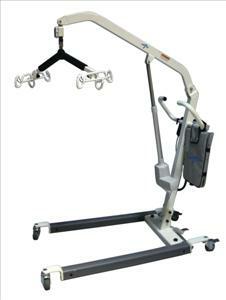 Base legs on these Powered Elevating Floor Lifts spread with a reliable, easy-to-operate foot pedal. Low-profile, base legs easily move under beds and other furniture. Controls are easy-to-operate and common between lifts. 6-point sling cradles provide flexibility for maximum comfort and safety.Available in 400 and 600 lb (181 and 272kg) versions.24V DC battery voltage. 80-100 average lifts/charge.3-year warranty for mechanical/electrical components, 1 year for battery.